Below are links and information related to employment law and relevant in our jobs as HR, Managers, or small business owners. Paid Family and Medical Leave has arrived! Close to 1 million pieces of direct mail were sent to employers. ESD presented at more than 260 events across the state. Had 6,739,408 impressions from our ads between the end of Oct. through mid-Dec.
Had more than 150,000 visitors to www.paidleave.wa.gov in Dec. alone. Get ready to be there for care. Since Nov. 30, we've sent out one email per week to over 630,000 employers in Washington outlining what they need to do on Jan. 1, 2019. Each of the emails are posted in the Newsroom on our website. 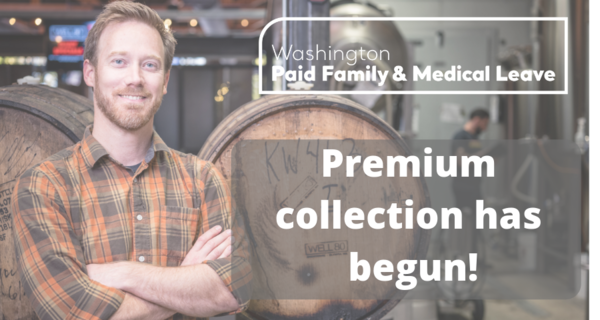 If you haven’t already, now is a great time to download our employer toolkit and review our Employer Page for details about premium collection that started on Jan.1. ESD filed the formal proposed rules (CR-102) for phase 3 of Paid Family and Medical Leave rulemaking. Filing the CR-102 opens the formal comment period on this phase of rules. The preliminary draft of our required significance analysis is also available for public comment. The rulemaking hearings for Phase Three will be on 3/13/2019 and 3/18/2019. Hearing details, including the agenda and remote participation information, are posted on the meetings page of our public comment portal. Attending the public hearing (either in-person or remotely) on 3/13/2019 or 3/18/2019 to provide oral comments. Submitting written comments on our public comment portal. Comments will be accepted online until 5:00 PM on 3/18/2019. ESD filed the preproposal statement of inquiry (CR-101) for the phase 5 of Paid Family and Medical Leave rulemaking. The CR-101 announces that an agency is planning to write rules on a subject and invites the public to take part in the rulemaking process by submitting ideas or comments about how the rules should be drafted. Following the CR-101, ESD holds a public listening session to gather stakeholder input on draft rules. We strongly encourage public participation. The first listening session for Phase 5 will be at 9:00 AM on 1/11/2019 in our Lacey office. Listening session details, including the agenda and remote participation information, are forthcoming on the meetings page of our public comment portal. OLYMPIA – County unemployment rates and employment data for November 2018 are now available online. Use the historical estimates report to view prior months’ data. Please keep in mind: Unemployment rates at the county level are not seasonally adjusted because the sample size is too small to accommodate that additional analysis. Therefore, they should not be compared directly to the seasonally adjusted statewide rate that we announced last week (Monthly employment report). ESD has labor market information and tools, including a video tutorial to showcase popular information and data. The minimum wage in Washington will increase to $12 per hour starting Jan. 1, 2019, for workers age 16 and older. The Washington State Department of Labor & Industries (L&I) enforces the state's wage-and-hour laws, which includes the minimum wage. The state minimum wage applies to most jobs, including those in agriculture. The cities of Sea-Tac, Seattle, and Tacoma have their own minimum wage rates. Check with those cities for specific information. L&I investigates all wage-payment complaints. More information about wage and hour laws and workplace right is available on L&I's webpage. 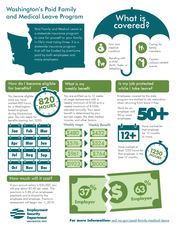 Employers and workers may also call 360-902-5316 or 1-866-219-7321. Click here for a Monthly Employment Report for July- August for WA. It shows the trends in a chart from 2011 indicating the decrease to date. ESD has labor market information and tools to showcase popular information and data. 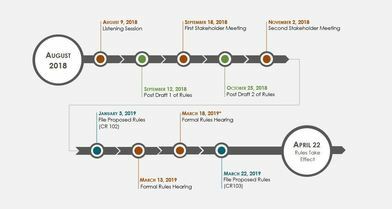 The third phase of rulemaking is set to begin in August following the filing of the CR101. WHEN: August 9, 2018 | 9 a.m.
Help us spread the news about Paid Family & Medical Leave by sharing these resources with your networks! How do you make a rule? If you're curious about rulemaking in general, you can find information on the department's process on our rulemaking webpage. For information specific to the Paid Family & Medical Leave rules, including timelines for each phase of the process (there are four), visit our public comment portal. Thank you for sponsoring us to attend HR Day on the Hill, personally it was my first time attending and visiting the State Capital. There were a number of speakers opening with Meredith Nethercutt, a SHRM associate who resides in Washington DC, basically going over the importance of why HR professionals should be involved in legislative matters as well make encouraging a cognitive effort to have presence with their local representatives, as that we do have an influence in legislative matters. Randy Littlefield from Department of Labor and Industries spoke, primarily focusing on Workers Compensation and the Abuse that occurs. He provided recent examples of high profile cases that occurred recently within EX law enforcement. Randy provided important steps on how to document a claim properly. Kara Craig, an Attorney from the law firm Vigilant, covered the recent movement of the “Me Too” era. She shared examples of sexual harassment claims that are in the media as well from cases she is representing. Stressing the importance of this subject doesn’t matter size of organization, bottom line listen to all claims let voices be heard, and investigate if necessary. Take away - training, training and training - now is the time to educate managers and staff. We want to ensure that our organization has taken action to be preventative. Bob Battles who is the Director of Government Affairs from the Association of Washington Business is the one speaker that addressed current bills that are being proposed. However there is no concreate update to report that I can share for certain that is going to take place because no new bill has been passed. HB 1301 / SB 5528 – Wage & Hour Anti-retaliation. Would create a 90 day protection window after any complaints or questions are made regarding pay. Employee complains about something regarding their pay… can’t fire them for any reason within 90 days or viewed as retaliation. Unsure if this will pass. To find contact information for your current legislators, including email addresses and web addresses, click here. Take a few moments to customize your email or letter because form letters are not given as much attention. Keep your written correspondence brief. Legislators don't have time to wade through lengthy messages. If you don't receive a response from your legislator within 10-15 days, send your correspondence again. They may not have received your original message. If you have questions or would like to know how the Mt. Baker Chapter participates in the legislative process, please feel free to email our Legislative Liaison, Harneet Sihota, at Legislative.mtbakershrm@gmail.com.